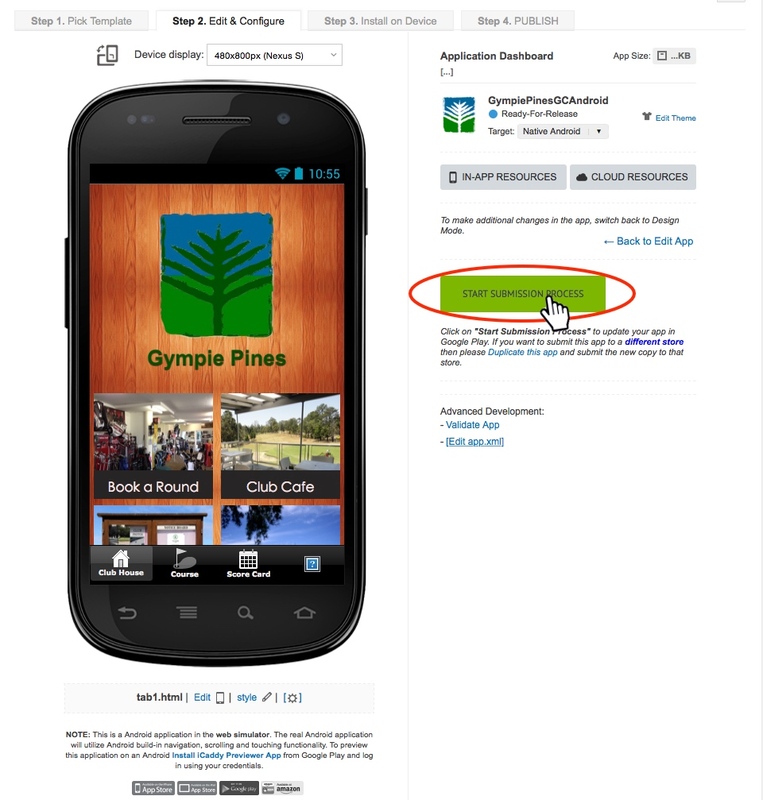 The following tutorial shows you how to publish your App on the Google Play Store. The iCaddy Apps framework lets you publish your App without your own Google Developer account. Publish using iCaddy Apps' account at no extra cost. Select ‘Publish Under iCaddy Account’. Click ‘NEXT’. 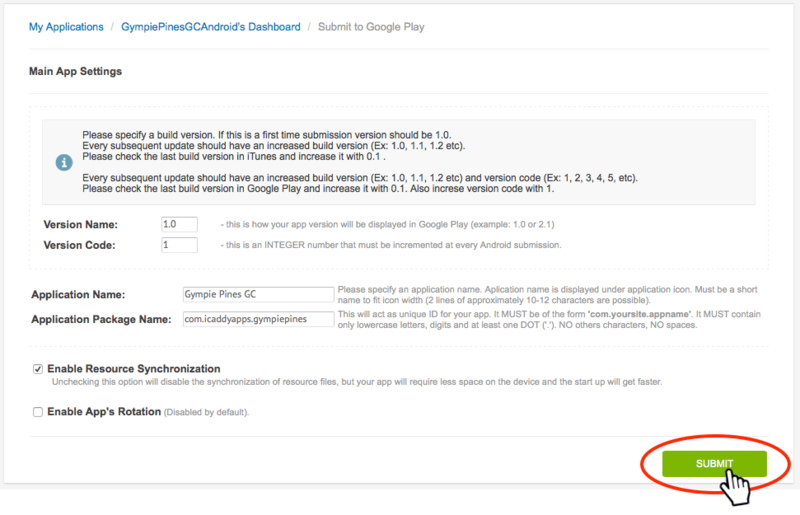 The ‘Google Play Properties’ screen will appear (as shown in Step 4 below). Note: Apps published on the Google Play Store must meet the copyright and other requirements specified by Google. For further information regarding Google Play publishing requirements, please refer to Google Play Developer Terms & Conditions. Google Play Properties. 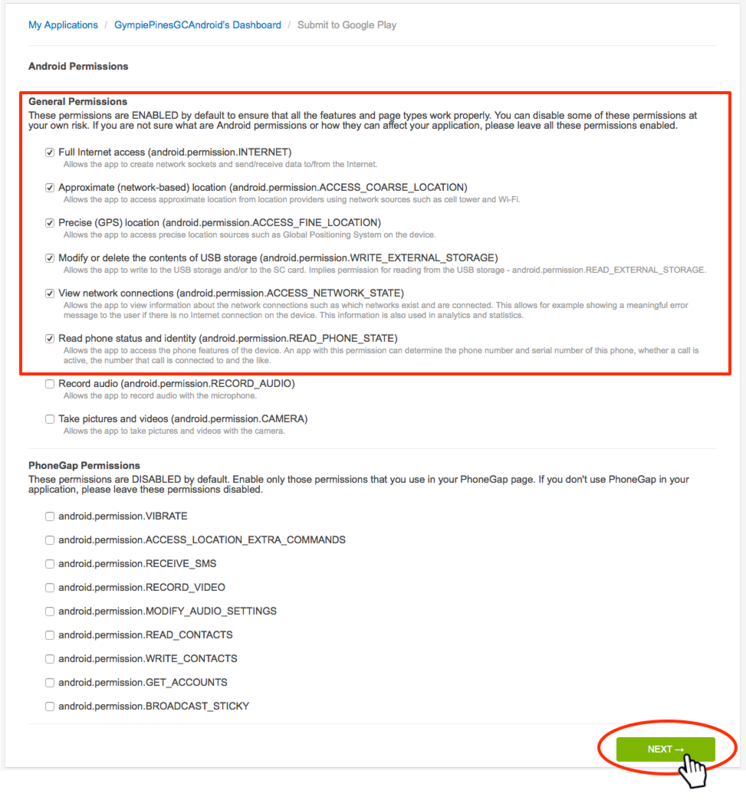 The publishing process requires you to verify the content in your App, including the App's 'Google Play Properties' (as shown above). If you have previously completed this information (as described in How to Edit 'Play Store' Properties & Multimedia), all the information in the corresponding fields will be pre-polulated. You can apply final edits here if required. 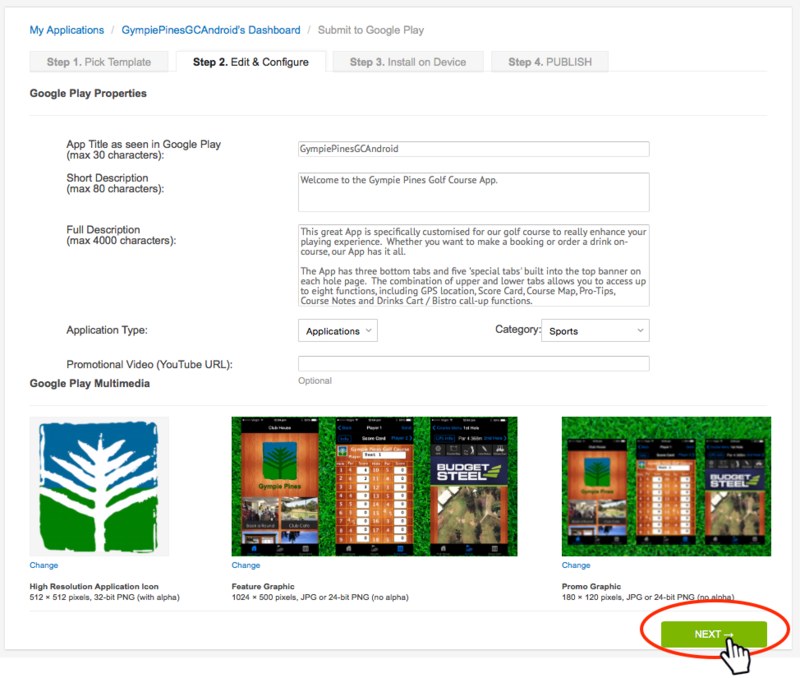 For further information on how to edit the ‘Play Store Properties’ for your App, go to How to Edit 'Play Store' Properties & Multimedia. Play Store Icon. Make sure the ‘App icon for the Play Store’ displays your preferred icon. 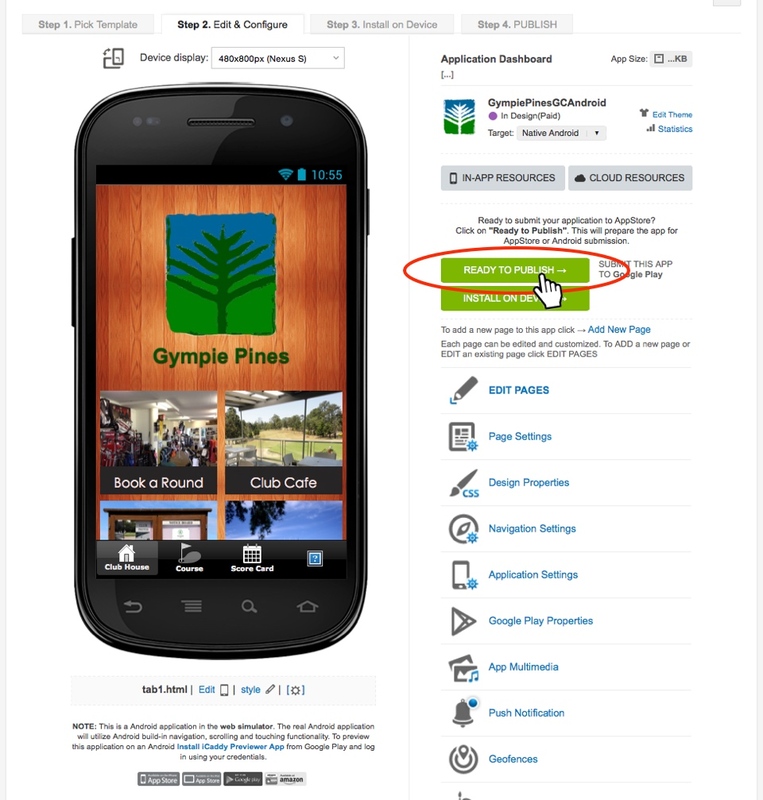 For further information on editing your App’s icon, go to How to Edit 'Play Store' Properties & Multimedia. Click ‘NEXT’. The ‘Enable Google Cloud Messaging’ screen will appear (shown below). Click ‘NEXT’. The ‘Android Permissions’ screen will appear (shown below). Android Permissions. Check (only) the boxes as shown above to ensure full functionality of your App. For some Android builds, you may also be provided with an option to select 'SCGolfScoreCard'. If this option exists for your build, make sure it is ticked. Click ‘NEXT’. The ‘Main App Settings’ screen appears (shown below). Main App Settings. Enter the ‘Build Version’ as required. Refer to the information provided on screen regarding build version increments. Important: This is the name that will appear on the Google Play Store. This name cannot be changed once submitted. Make sure it is right! ‘Enable Resource Synchronization’ should be checked by default. Ensure this is checked. Do not select 'Enable App's Rotation'. Note that this does not affect playing videos in landscape view on your device. Click ‘SUBMIT’. The ‘Request Process Complete’ screen will appear (shown below). Congratulations. 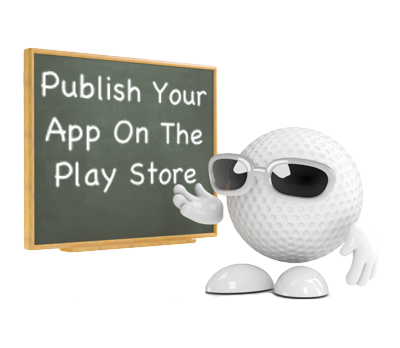 You have successfully requested your App to be published on the Google Play Store.